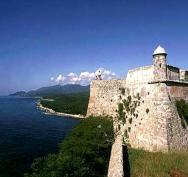 The city of Santiago de Cuba is located within the South Eastern region of Cuba and has much to offer its visitors especially if they enjoy culture and art as there are many museums and art galleries throughout the city. There are several shops and stores and the nightlife is vibrant, much of it is housed within hotels but many of them do let other people, other than their guests, enter. School info: School is not housed in one building, students take classes in cultural centre, teacher’s home or host family house. Santiago de Cuba is the second biggest city located on the island of Cuba and it is an historian's playground with many fascinating features to observe. The Museo del Carnaval is a delightful museum to visit as it gives a complete history of the carnivals that have been through the city. One of Cuba's initial museums to be set up is called the Museo Emilio Bacardi and it boasts a valuable collection which covers the duration between the Spanish conquest and the Wars of Independence, this was from Spain. Visitors to La Moncada can witness the aftermath of the attack by Fidel on the Spanish army whilst they were in their yellow barracks. There are letters, pictures, documents and even uniforms to be seen. The exterior of the buildings are covered in bullet holes serving as a stark reminder of what unfolded on that July day in 1953. The city of Santiago de Cuba is not known for its culinary delights but having said that the Melia Santiago restaurant serves some delicious food; their pizzas are certainly worth trying. There are numerous shops throughout the city including Supermercado Plaza de Marte which is a very well stocked supermarket for all your grocery related needs. Music of all different kinds can be found for purchasing at the Discoteca Egrem store.